The Wheel of Fortune Card represents good luck and a lot of success in financial matters. It also represents the impact of fate and chance usually for the improvement of their situation, as well as favorable changes in their life. 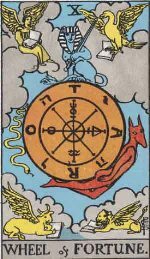 The Wheel of Fortune, as the name suggests, bears the figure of a wheel that keeps moving all through the eternity. The wheel also has some people and animals on it. While some of them are falling off the great wheel and getting crushed, there are others who are struggling to remain on it. There is, however, one solitary figure that sticks to its position successfully. The seasons go on changing, the sun and the moon continue to rise and set, the planets also keep moving like the wheel of fortune mindless of the fate of the human beings. Only those who stay at the center, i.e. who understand that change is the way of life are not affected by the movement of the wheel of Fortune.